It looks like spring might actually make an appearance in Michigan this year! I have already poured through my seed and bulb catalogs, so now I am itching to get out into the garden! I watched the weather and it looks like we have a very small warming trend this week; it may actually get up to 50 degrees on Friday afternoon! I know it will be chilly and the snow will still be melting, but I plan to take a little tour of my garden and make a list of what I would like to do this year. I love lots of color in my garden, especially because I love to paint the flowers that show up to visit. Most of my garden is filled with perennials, and then I get a few annuals to fill in the areas where color may be lacking through one part of the season. These flowers were painted in 2004. The "models" were from my friend, Suzanne's garden. 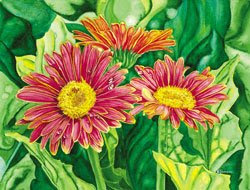 I called this piece Smiling Faces, because these daisies were so cheerful, colorful and full of character, that it seemed as though they were cheering me on as I painted. I have really enjoyed doing close-ups of flowers and I never get tired of them. When painting a close-up view it's like studying a detailed landscape. It is such a beautiful miracle to watch a garden grow and to focus on some of those incredible little details. If you are living in a warm climate, send some of that warm weather to our spring-starved Michigan, will you?